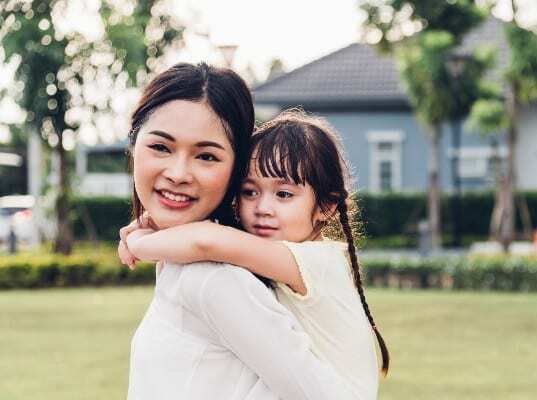 Single moms can have it tough trying to become a homeowner — between raising their children on their own and paying all the bills, buying a house seems almost unachievable. But, there are loans available and lots of assistance programs to make the dream of homeownership in reach for single mothers. Click here to check your homebuying eligibility now. Female single buyers has continued to remain steady at 18 percent of all recent homebuyers (down slightly from 20 percent in 2010) according to the National Association of Realtors (NAR) Profile of Home Buyers and Sellers 2018 Survey — making single female homebuyers the second most common type of homebuyer behind married couples at 63 percent. Single male buyers came in at 9 percent. The median purchase price for female single buyers, though is the lowest of all household buyer types ($189,000), including single male homebuyers ($215,000). In many real estate markets across the U.S., this means homeownership will continue to be out of reach for many single mothers. Click here to see if you qualify to buy a home now. But, there is hope for single moms looking to get a home loan. A good place to start is to see what’s available through your local housing authority (a quick Google search will do). Its website can tell you what specific homeownership programs, grants, and loans are available for your situation in your city or state. According to NAR’s 2018 survey, the median down payment amount for first-time homebuyers was 7 percent, and 13 percent of all buyers stated saving for a down payment was the most difficult part of the homebuying process. Baltimore City’s first-time homebuyer program (CDBG Homeownership) offers a $5,000 five-year forgivable loan to first-time homebuyers to assist with down payment and settlement expenses. Maine Housing’s First Home Program provides low fixed rate mortgages with little or no down payment. All First Home mortgages also come with payment protection for unemployment. Pinellas County, Florida, First-time Homebuyer Program helps with down payment and closing costs assistance with a $7,500, zero percent interest loan that is deferred until you sell, refinance, or payoff the home. Click here to see if you are eligible to buy a home using a down payment assistance program. No matter where you live, there are several mortgages to look into if you’re a single mom. Each have low down payment requirements, less strict credit requirements, and/or different mortgage insurance requirements. “You should investigate these loan options for your situation with your lender,” says Gundersen. FHA loans usually have low interest rates and only require 3.5 percent down. (That down payment can come as a gift too.) Also, your credit score doesn’t have to be excellent either. Depending on the lender, a minimum of 600 is accepted in most areas, while some accept 580. One of the down sides of an FHA loan is the mortgage insurance premium (MIP). It’s usually almost double what most people pay with traditional conventional loans called private mortgage insurance (PMI), when the down payment is less than 20 percent of the loan. “For FHA loans, you will pay mortgage insurance till the end of the loan even if you paid off 50 percent of the principal. It’ll be there until you refinance or sell the house,” Gundersen says. Get an FHA rate quote here. If a single mom is eligible to get a VA loan through her own military service or as a widow, it could be the best loan product out there for her. This loan is available to military veterans and their families with no down payment requirement, and the government backs 100 percent of the financing. There is no private mortgage insurance to worry about either. Have military experience, or are a surviving spouse? Check today's VA rates. United States Department of Agriculture (USDA) offers a variety of loans to help low- to moderate-income people buy homes in rural areas. But, “rural” can be a misnomer — many of the properties are available in areas surrounding popular, metropolitan cities. USDA loans have very low interest rates and no down payment requirement. You are eligible for 100 percent financing, and the mortgage insurance premium is lower than that of FHA loans. USDA loans do have maximum levels of income, but most single moms will be well below income limits. See if you are eligible for a USDA loan by completing a short online form. Gundersen says that you may need at least 5 percent down payment of your own money for a conventional loan. But conventional mortgage products like HomeReady™ only require 3 percent, and even allow you to use renter or boarder income to help you get approved. You will need a pretty good credit score and credit history, but some lenders are lowering their credit score minimum to attract more buyers. If you don’t put 20 percent down, you will pay private mortgage insurance up to the date you reach 20 percent in the principal. You can choose from 10-, 15-, 20-, and 30-years fixed to pay off the loan’s principal and interest. Get a conventional loan rate quote here. There are tons of programs that help single moms get approved to become a homeowner instead of a renter. Get a free eligibility check and be on your way to giving the gift of homeownership to yourself and your kids. Click here to check your eligibility.